The Prime Minister of Romania (Romanian: Prim-ministrul României) is the head of the Government of Romania. Initially, the office was styled President of the Council of Ministers (Romanian: Președintele Consiliului de Miniștri), when the term "Government" included more than the Cabinet, and the Cabinet was called The Council of Ministers (Consiliul de Miniștri). The title was officially changed to Prime Minister during the communist regime. 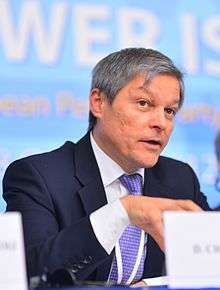 Prime Minister Dacian Cioloș, an independent, took over the position on 17 November 2015 after the resignation of Victor Ponta on 4 November 2015 following the Colectiv nightclub fire and the ensuing large street protests. The Prime Minister directs Government actions and co-ordinates the activities of its members. He submits to the Chamber of Deputies or the Senate reports and statements on Government policy, to be debated. The President cannot dismiss the Prime Minister, but the Parliament can withdraw its support through a vote of no-confidence. ↑ "VICTOR PONTA A DEMISIONAT". Retrieved 4 November 2015.